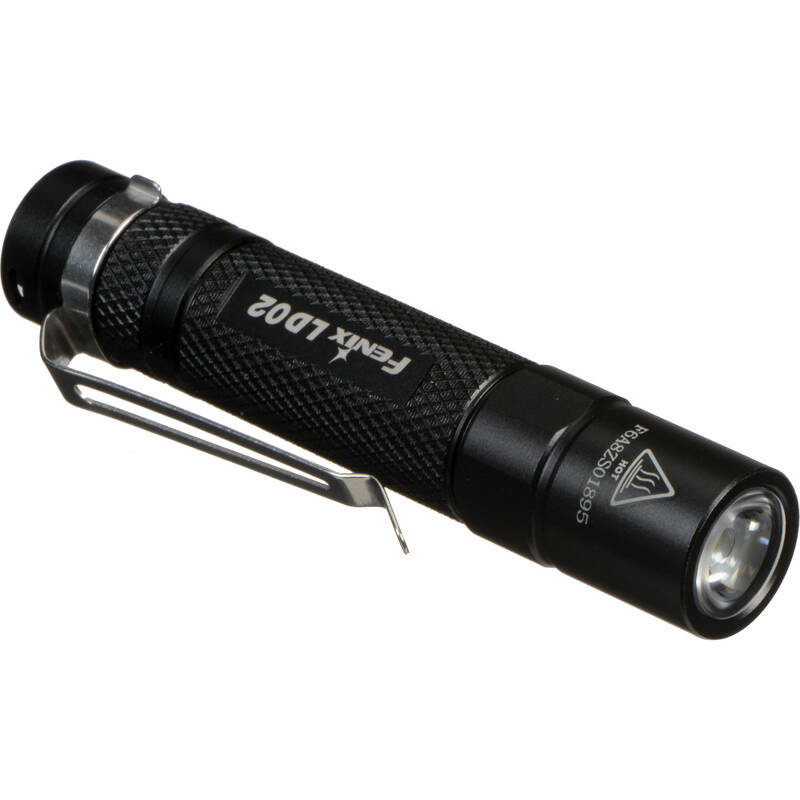 Striking a delicate balance between portability and power, the Fenix LD02 LED Pocket Flashlight outputs up to 100 lumens, yet is just 3" long and weighs less than an ounce. Its Cree XP-E2 LED provides three outputs from a low 8-lumen to a high of 100 lumens. The output is digitally regulated to ensure a consistent beam intensity at all outputs throughout the life of the battery. Overheat protection circuitry automatically steps down the output to avoid damage to the light if it gets too hot. A shroudless click-type push button switch controls the modes: simply click to turn it on, then press the button to cycle through the outputs. Designed for daily use, the aluminum housing features a scratch and corrosion-resistant Type III hard anodized finish. It is impact-resistant to 3.3' and IPX8-rated, allowing it to be submersed to 6.6' for up to 30 minutes. Rounding out its usability features is a textured anti-slip grip, an anti-roll collar, and a removable pocket clip. Powered by a single user-supplied AAA battery, it also supports alkaline, lithium, and NiMH batteries. Box Dimensions (LxWxH) 4.252 x 2.992 x 1.024"
LD02 LED Pocket Flashlight is rated 4.4 out of 5 by 5. Rated 4 out of 5 by Jesse from Great little light Got this light for my girlfriend and she loves it. Sweet little light, very pocketable and bright. 3 brightness levels, although I wish it remembered which level you left it on--it automatically turns on at medium. The tail button is easy to actuate, although on a flashlight this small, I personally prefer a button on the side, just makes more sense with the way I use a little light like this. Overall a good light. Haven't gone through a whole battery yet, so I don't know about the power efficiency but from other Fenix lights I've used, they are pretty good on that front. Rated 5 out of 5 by T-CAT from carry it everywhere This is the right size to carry everywhere. The battery it comes with lasted a day of playing and testing then on steadly for 18 hours. I dropped in into a Japanese bath tub, more than a metre deep, and it was fine. I'd already dropped it from hip height, I am rough on tools. This is now in my trousers pocket. The light I had before had one hour on a battery. So the Fenix light is great. It also has a very bright light when you want it. Rated 4 out of 5 by Mordecai from Good little Good Little Flashlight PROS: Bright, Compact, 3 Brightness Settings, Push Activation and Single AAA Battery CONS: 1) Sometimes the Flashlight gets turned on involuntarily, be careful and keep an eye on for that. 2) It did not come with a keying. Rated 5 out of 5 by PENNY from GREAT find! SUPER BRIGHT & LIGHT WEIGHT! SUPER BRIGHT!!! Very small, and light weight. I saw it at a mega... sporting/out-door store & had to have some (for home, on person & to take while traveling... very light wright). B&H had the BEST price; as usual.